Robots play a key role in achieving manufacturing efficiencies and reducing labor intensive operations across diverse industries. Traditional machine vision has its limitations, however—typically, it can only conduct defect detection and classification based on fixed rules and work in fixed environments. To add on, the complexity of robotic system design poses challenges for many manufacturers to identify and integrate subsystems from multiple vendors. The future of robot and machine solutions is a production environment where devices, machines, robots, and sensors are interoperable. 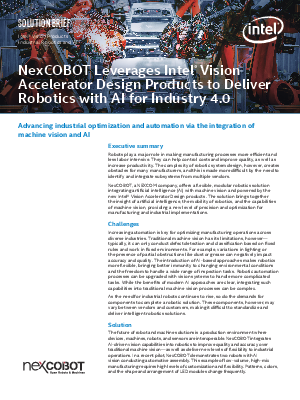 Find out how NexCOBOT integrates AI-driven vision capabilities into robotics to improve quality and accuracy over traditional machine vision—as well as providing an open and modular solution for users to develop a robot control system that best fits their particular application requirements.